How to Make a Career in Digital Marketing in India? What’s more You can do? Do you ever want to know all about career in digital marketing at one place? From opportunities to learning digital marketing? Then you’ve landed at the right destination. Hello, I am Kanishk Matta, Digital Marketing Consultant and Entrepreneur. I get a lot of questions on digital marketing from young graduates to professionals. To answer all of them at once, I have written this blog. Read on to explore the world of digital marketing. Don’t forget to subscribe and share this blog with your friends on Social Media. In 2009, I started my career in digital marketing. Then, India’s digital marketing industry was at nascent stage. Since, then industry has come a long way. Today, billion dollar companies in digital marketing industry of India are commonplace. Above all, India’s start up culture is lead by boom in digital. Also, growth trajectory is on the up slide now across digital sectors. Digital Marketing career in India is one of the high paying careers in India. A fresher entering digital marketing career in India can easily get high paying job. Moreover, anyone with digital marketing skills can break into India’s startup culture. This automatically makes learning digital marketing a big game changer. The digital future in India is quite bright and has immense potential. This is the right time to dabble into it. If you’ve heard of ‘Cashless Economy’ in India recently, let me tell you digital is the key behind it. Still wondering if digital marketing career in India has so much of potential? A research report by IAMAI and BCG estimates that India’s internet economy to grow by Rs. 10 trillion by 2018. This figure will account almost 5 percent of India’s total GDP (gross domestic product). In 2016, India’s internet population already crossed 450 million mark. It is now second largest internet population in the world. According to a Nasscom report India’s internet population to reach 730 million by 2020. At present, India’s eCommerce industry is witnessing a big boom in business. According to Deloitte and CII report, India’s eCommerce to grow at 6 times over 5 years’ period. From US$ 16 billion in 2015, it will reach US$ 40 billion in 2018, and US$ 101.9 billion in 2020. The same report predicts a big leap in online shoppers’ population from 39 million in 2015 to 220 million by 2020. 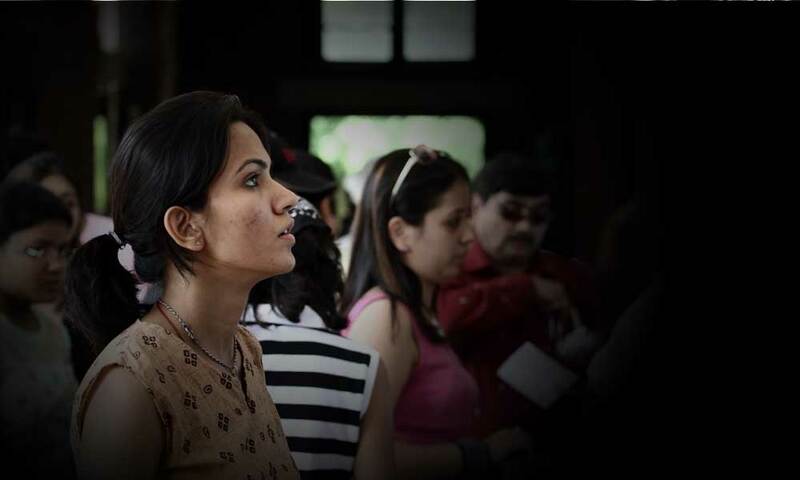 In India, there’s a huge demand for professionals in digital industry. But, dearth of professionals has been adding to the demand. According to a survey, situation is so bad that it is affecting 94% of companies. Also, 77% of companies sees gap in digital skills is a key hurdle to their digital transformation. This makes opportunity in digital marketing career gigantic and lucrative. 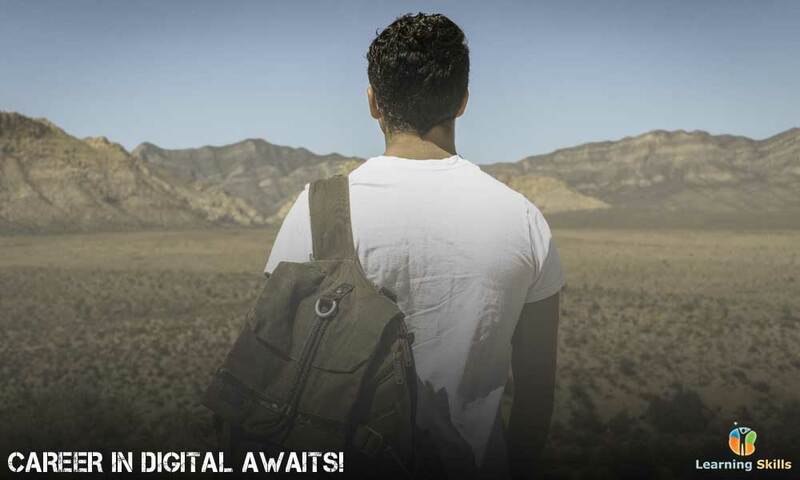 At personal level, what lies ahead for you in digital marketing industry of India? There’s much more in kitty for you than you know it. Interesting, isn’t it? The environment in India is so conducive, a trained fresher can get a job in no time. Add to this, there are countless lucrative job opportunities. 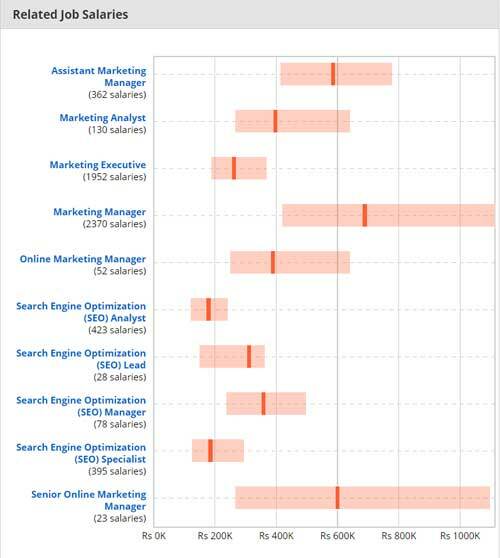 Companies and employers are fighting to grab the skilled talent in digital marketing industry. There is dearth of trained people in digital marketing plus huge demand for them. That’s why we have high salary packages for trained fresher digital marketing jobs. As you enter the field within few months of experience you will notice fast increment in pay and position. Provided you deliver on the job. 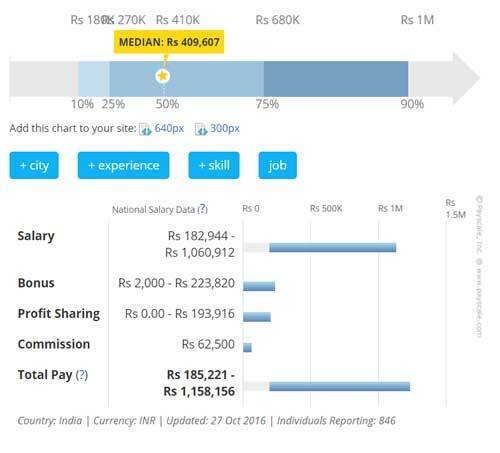 The average pay scale for a digital marketing manager job revolves around 4 lakhs per annum. A trained fresher may grab around 2-4 lakhs per annum package. Often package can touch 6-10 lakhs per annum. Unlike other industries, digital marketing industry is creative and open. Almost everyday you get opportunity on the job to create and innovate at your pace. With content at the core, you can experiment a lot with in text, graphics and video. You can either start a YouTube web series around your product. Or write a blog and develop infographics to engage your target audience. Meanwhile, the offline advertising world is facing pressure to show measurable returns on investment. As offline channels are losing sheen, it is now difficult to justify low ROI in it. Whereas, online marketing not only track each penny but offer high ROI. Including, winning the competition by insurmountable gap. Do you know by next year Digital Ad spend to surpass TV? 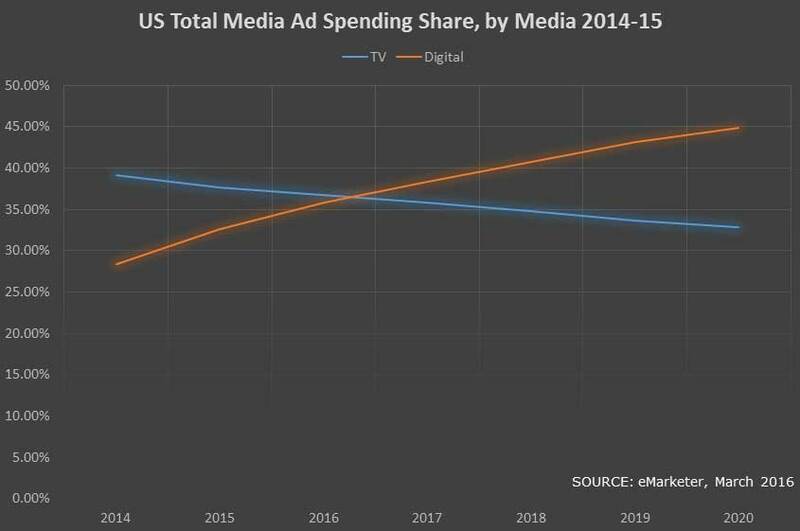 And by 2020, TV Ad spend will drop below one-third. As it is easy to generate sales and leads online. That is why, you don’t have to feel pressure for delivering ROI. Ultimately, you get independence to experiment and innovate at your own pace. Climbing the ladder up in digital marketing industry is not much difficult. All you need is to prove your worth and your digital skills in a project, and bring in the numbers. Voila, you will be on top of the game. I am not kidding. There are only handful of professionals in India that can boast such a milestone. You too can do this, only if you have complete knowledge, and skills in digital marketing. Thereafter, no one will be able to stop you. As you enter industry, you will find it easy to climb from executive level job to managerial position. Thereafter, decision making positions in marketing. That too within 2 years’ period. I can tell you this, because, I have been there, and done that. Read out my profile and experience on my personal website, to know more. Such an opportunity to grow is rare in any industry today. In India, there is lot of demand for digital marketing trainers. Not just in private institutes, but also in government colleges, universities, and b-schools. Furthermore, there are many companies and startups looking for corporate digital marketing trainers. You too can grab these training opportunities. Provided you have knowledge, skills and proven experience in digital marketing. LinkedIn is the best place to get hired as digital marketing trainer in India. Around 70% of training opportunities I get come through my LinkedIn profile. And rest through my network. You can check out my LinkedIn profile here. You can make Rs. 2,000 to Rs. 8,000 per day as a beginner in digital marketing training in India. As you gain experience, per day pay increase up to Rs. 15,000. Apart from this, you get other incentives in shape of reputation and network. The Internet world is fast moving and ever-evolving landscape. That in turn makes digital marketing quite dynamic industry. An industry, where everything is seeming to be moving forward daily with visible changes. Also embracing and absorbing everything new. technological advancements and lot more. More so, this may also give you competitive advantage over your rivals. Therefore, for a competitive digital marketer, it becomes imperative to stay updated always. Actually, it is attached with your survival in digital marketing industry. You will need to update your knowledge and upgrade your skills in time. Otherwise, you will lose everything immediately. For example, you may have a website with huge amount of traffic from Google search. Quite possibly, you may wake up next morning to only find that Google algorithm has hit your website. Now your website is out of Google search engine overnight. Eventually, you will lose all your traffic, sales and business in a snap. That can happen. It happened to us, way back in 2010. And let me tell you, it takes whole lot of efforts to get into the top searches of Google. P.S. : recently digital payments and eCommerce are witnessing astonishing boost in their sales. It is due to demonetization. That too, overnight. This advantage, you will rarely find in any other career avenue. With skills in digital marketing, you can start your online business, anytime. All you need is a product/service to sell online. Or you could even start blogging and earn through advertising and/or affiliate marketing. Making a successful business out of it. Many has done that. We already have renowned names in digital marketing industry, who made millions. Neil Patel started out as a blogger. Now, he is one of the most renowned digital marketing experts in the world. Then, we have Gary Vaynerchuk started out as a Wine shop owner. In 2006, he started his web series on Wine reviews. Now, he’s a founder of VaynerMedia a digital media and marketing agency. There’s so much inspiration available in digital marketing industry for an entrepreneur in you. I started my career as a freelancer. Many have done this in digital marketing industry of India. You too can do this. There are countless freelance bloggers, vloggers, marketers and consultants in India. Interesting thing is that they are making more than decent living from digital. You could can either launch your own blog, or help someone build one. You could even start your YouTube channel. I hope you already have heard names on YouTube such as Superwoman, Jus Reign, BB Ki Vines and Carry Minati. There are lot of freelance/part time projects and jobs available in digital. Not just from startups but also from mid-sized and large corporations in India. 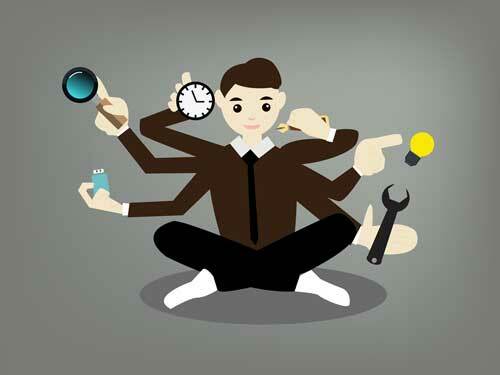 You could make whole lot of extra working as a freelancer. We have live examples already in India itself. Just Google, you will find numerous inspiring stories of freelancers. Also, search for groups ‘Startups India’ or ‘Startups’ + your city name on Facebook. You will notice there many cities specific groups on Facebook. In these groups, lot of startups are searching for freelancers in India. Digital marketing freelancers, web developers, consultants, what not. Years back Government of India (GoI) has had already realized the power of the Internet. Now, we are seeing scores of new initiatives to digitize India’s economy. 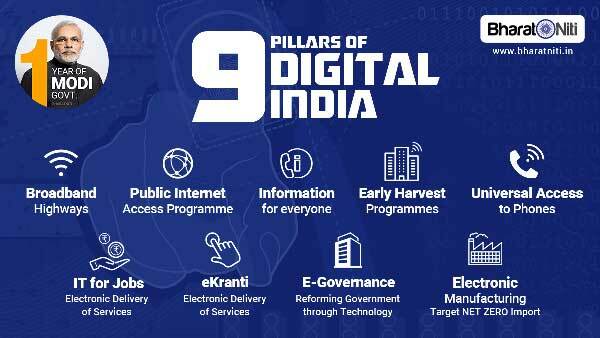 GoI introduced Digital India initiative for digital transformation of governance, economy and our society. GoI online service that allows you to keep your important documents secure online. RBI provided licenses for Online Payments Bank to 11 companies in India in 2015. In 2016, Government approved 100% FDI in eCommerce Marketplace industry in India. All these initiatives have contributed to India’s economy boom. That in turn has increased demand for digital marketers in India fourfold. 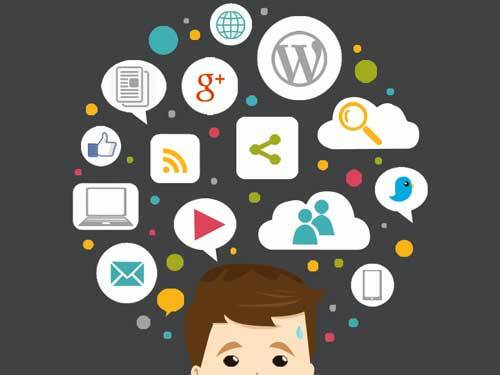 Now the question is how do you enter this exciting world of digital marketing? There are three ways to learn digital marketing in India. Self-paced: this is where you will need to guide and plan your studies yourself. You can start your learning journey by reading blogs and websites online. Furthermore, you can use e-books, books and magazines in digital marketing to learn it. Assisted: this is where you find yourself a mentor or a digital marketing institute. It is the most preferred route for anyone learning digital marketing. Because you get more hands-on knowledge and skills learning opportunities. Moreover, you become employable immediately after the digital marketing course. Hybrid: this is the route, I recommend. It is a combination of above two. You not only manage your pace and space of learning but also get an expert help to guide and enlighten you. It is upon you to choose your learning journey. Later in the blog, I have provided free resources you can use to learn digital marketing. Also, we have few tips for you on assisted learning. Now, let us talk about your destination here first. ‘Acquiring relevant Digital Marketing skills’ – before moving on to how to learn digital marketing? It is good to have knowledge in digital marketing. But you will need expertise and skills in digital marketing to get hired. I have listed out the most in-demand digital marketing skills in India. 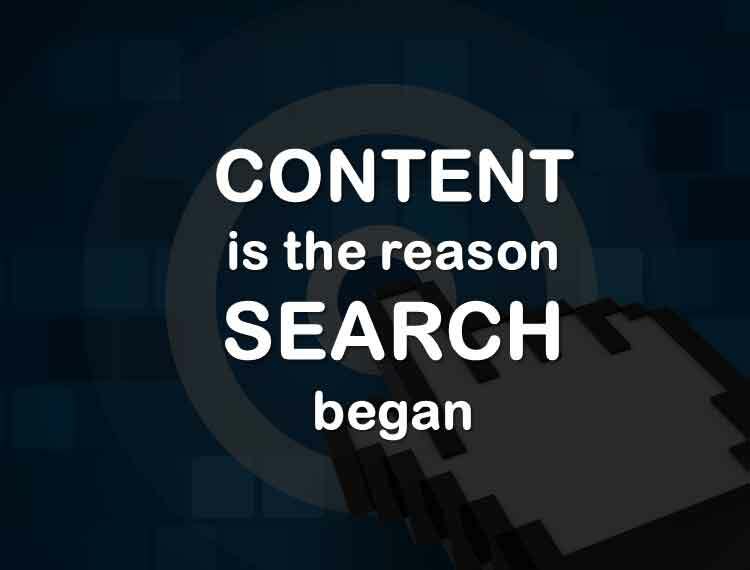 Content marketing is one such area in digital marketing that has unfathomable scope. Also, immense potential for creativity and innovation. 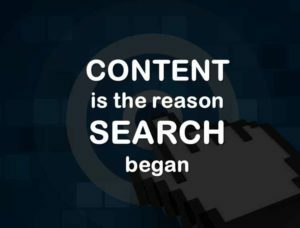 It’s no big statement to say – “content is an indisputable champion in the digital world”. Content can make a brand or break it. In the world of Television, why do you watch Kapil Sharma Show? It is not because of the Navjot Singh Sindhu, other characters or Kapil himself. It is because of the entertaining content, which are jokes, comedy, acting and others. The day Kapil stops making funny jokes, he may go out of business. I am talking about the ‘content’ here. I couldn’t simplify more than this. Similarly, content is king in online world as well. Digital marketing won’t get you the desired results without relevant and quality content. Writing Skills: it is crucial to have good (or excellent) writing skills. You get many opportunities to write on variety of topics, and in various formats. It can be blog, press release, video script etc. Graphic Designing Skills: you will always feel the need for graphic designing. You can do with basic designing skills in Photoshop. Besides, good knowledge of fonts, icons, image editing, photography and others may come handy. Adobe After Effects (difficult) etc. The digital allows you to measure, track and trace everything, anytime and anywhere. That is why, to analyze huge amount of data and information, you must have analytical skills. A report by The Economist ranks data analysis in top three skills must have digital skills. There are lot of tools available to measure and track digital marketing campaigns. Google Analytics, Google Webmasters, and Kissmetrics are the top popular web analytics tools. This is not possible in any other offline market condition. Besides, there are many web analytic jobs available in India’s digital industry. That too, with high pay packages. Just search for web analytic jobs on any popular job portal in India such as Times jobs, Naukri etc. You will be surprised by the demand and salary packages. If you already know digital marketing, then you must have some idea about SEO. It is always in-demand skill in digital marketing industry. It is the first thing that anyone hiring you in digital marketing industry will look for in your resume. 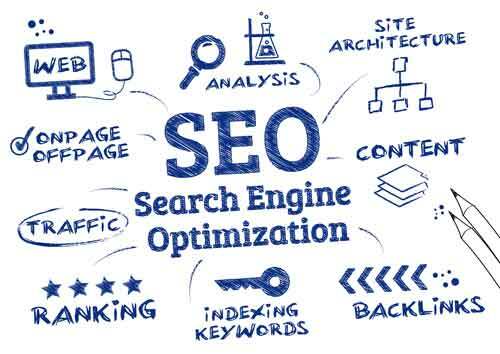 In SEO, Google search engine optimization is the most important thing to learn. Because all other search engines follow Google search engine. Also, Google search engine is the biggest web traffic source in the world. It is about finding out the right keywords to reach the target audience. Meanwhile, targeting is about planning to use these keywords to reach the target audience. It is about optimizing your website that enables you to get into the top searches. On-page optimization is more important to get into the top ranks. Also, user experience and design are part of it. It is about getting the quality links and taking out other measures outside your website. Recently, Google algorithm updates have reduced its effectiveness but still it is relevant. In SEO, there’s lot to learn apart from above. Also, SEO is the right blend of art and science, where you need to be creative and technical at the same time. Many SEOs in India lacks knowledge and skills in on-page optimization. You should focus on on-page optimization. It is quite technical. But learning and acquiring skills in it will be helpful in long run. Search Engine Marketing is different from SEO, where you pay to get into the top searches. Google Adwords is the best service provider and also is the biggest paid traffic source in the world. You could take up free certification course in Google Adwords, anyone can join it. 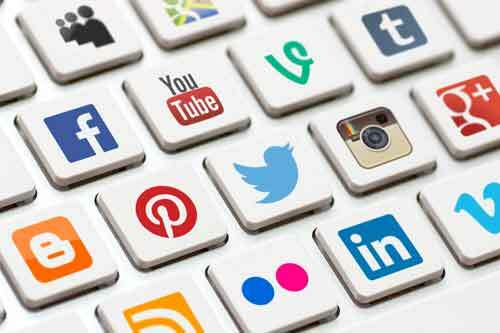 Right after search engine, social media is the next big traffic source in the world. You just cannot ignore it. When you think about social media platform Facebook may come to mind. But there are many more, from where you could attract high quality and targeted traffic. Besides, there are many niche social networks in real estate, education, art and design. With so much of platforms, there is so much to learn about social media marketing and networking. Content has a special place in SMM. You could engage your audience and get real time feedback. If your audience love your content then it may also go viral. Remember, ALS Ice Bucket Challenge? Facebook is the top undisputed social media platform with more than 1.5 billion users. It may always find its place in your SMM strategy. However, Facebook keep updating algorithm and improving its technology at regular intervals. It is important to keep yourself updated with these changes. Apart from Facebook, all other social media platforms have their unique ecosystems and identities. For example, LinkedIn is the professional network. There you will find people only interested in career, education, job and business. You will need to get the gist of it. Thereafter, you will have the idea about how to get at the right place, always at the right time on social media. For new campaigns, seasons, and festivals you will have to plan at regular internals. That is why, having skills in researching and strategy development is vital. There’s abundance of data and information, you not only need analytical skills. But also you will need these skills to come out with the actionable insights. Whether you are working as manager, running business or working as a freelancer. You will always need these skills to beat your competitors. You should know, where you will get the data and information required. There are lot of tools such as BuzzSumo, Google Trends that can help you research online. You also need basic knowledge to use given data and information in strategy and planning. to achieve your marketing objectives. Researching skills will work in conjunction here. This will help you come out with the innovative and creative strategies. There’s a research report by Smart Insights that surveyed more than 1,000 marketers. The report highlights that digital strategy and integrated planning are the most sought after digital skills in 2015. Today, online researching and strategy are intrinsic part of marketing plan. 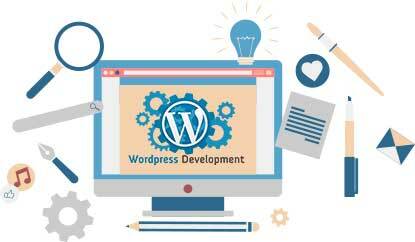 Already there is dearth of professionals for WordPress development in India. Add to this, young digital marketers lack knowledge and skills in WordPress CMS. WordPress is the world’s most popular CMS. Almost 25 percent of new websites developed are in WordPress. Thereby, it is important for young digital marketers to know WordPress. Largely, this is due to less focus on WordPress in digital marketing courses in India. structure and optimize your website for maximized conversion? create a high performing landing page for sales? maximize engagement with innovative content on website? create your blog to engage your target audience? enhance web speed and improve user experience? Then how can you expect to be successful in digital marketing industry? In web development there’s lot to learn, but basic HTML, CSS and coding knowledge will take you a long way. There’s lot of free resources and courses available in it. Learning WordPress will fruitful for your career in digital marketing. Skills in it will allow you to create high performing and professional websites. More so, learning WordPress will open the door for you to learn other CMSes such Joomla, Drupal etc. Frankly speaking skills in WordPress will rocket boost your career in digital marketing instantly. Blogging is part of content marketing and web development. But, I have given it a separate space here, why, because blogging is a discipline in itself. There’s a lot to explore about blogging. We have had, where hobbyist bloggers turned into millionaires. Pat Flynn, Neil Patel, and Gary Vaynerchuk, are examples for us. First, you have to agree on – blogging is a craft. That comes in different shapes and sizes such as article, news, video, infographics etc. Second, you have to become go-getter and risk taker in blogging. You have to go out and bring the best content, either inside or outside your company. Visit events, interview people, talk to experts and experiment a lot. Last, keep learning and improving your skills in writing and content development. Because, new technologies keep disrupting content development sector every now and then. Recently, video recording drones are doing it. Learning blogging is not difficult if not easy. All you need is to follow popular bloggers in the world online. And learn by observing how they attract huge traffic, and engage their audience. Beginners in digital marketing tend to overlook email marketing. Also, skip email marketing, while learning digital marketing. It is an important part of digital marketing. It is because email marketing has the highest return on investment (ROI) in digital. There are lot of email marketing tools such as MailChimp, Marketo, ExactTarget, MailPoet etc. You can learn one of these, and head start in email marketing. There’s huge demand but dearth of professionals in email marketing. Few months of experience and skills in it would get you hired in no time. Did you ever visited a website, which has scrambled content all over the place? That also bombards you with innumerable pop ups? If yes, then you must have idea on how challenging it is to tolerate such a website. However, you also must have visited a neatly designed website or blog. That allows you to navigate inside the website and reach the best information in no time. In both of the examples, user experience design and user interface were at the play. In the first example, it was poor, but in the second it is good. 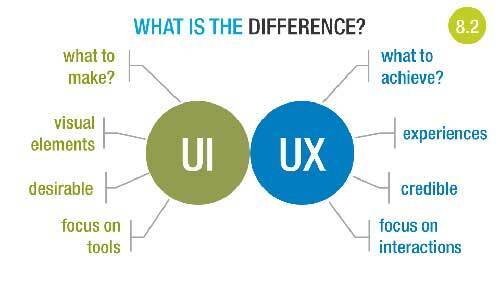 For a digital marketer, it is essential to understand basics of UX and UI. Not just from SEO viewpoint but also site structure and sales perspective. There’s lot of scope of learning and hidden potential in UX and UI waiting to be found for any digital marketer. Do you know even bright orange button is strategically placed to entice you to click on it? After understanding the knowledge and skills required to enter digital marketing industry. Now, let us move to – how to learn digital marketing and develop these in-demand digital skills? There are variety and abundance of advice available on it. You can check out this Quora’s discussion thread on how do I start a career in Digital Marketing? But, I would recommend you to find your own way of learning. On Internet, you will find from easy to advanced digital marketing topics to learn. It is just a search away. 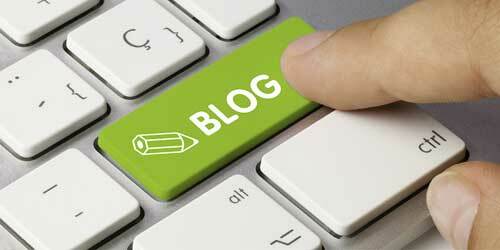 Blogs can teach you a lot on variety of topics in digital marketing. There are loads of blog to read. However, you have to be selective in your reading. If you want to learn digital inbound marketing in-depth then HubSpot blogs are the best read. They have excellent content and tutorials to learn from. I love in-depth blogging on SEO here. Including, Whiteboard by Rand Fishin (Moz Founder) every Friday. No SEO professional can afford to miss it. It is a hub of all news, updates, and trends in digital marketing world. Stay updated with latest happenings in digital world by following this blog. For reading tutorials and blogs on analytics, testing and digital marketing. They literally built their business from their blog. If you love orange color and want to learn the content marketing then go to CMI now. It started as a blog, now it is full grown and popular digital marketing company. If you want to learn all the nuts and bolts of content writing and development, this is the place. As name says it all, it is a blog on social media marketing. From detailed tutorials, events, seminars to excellent blogs. It has everything that a successful online community should have. Recommended for any beginner or professional in digital marketing industry. You get all the tutorials and blogs on almost all digital marketing topics here. Quick Sprout, which again has lot to offer in digital marketing blogging. There’s a Quick Sprout University, where you can learn from beginners to advance levels. It is one of the most popular blog that covers all complex topics in SEO and link building. This blog can help you become expert at SEO and link building. It is a blog that can teach you a lot about Social Media Marketing and Content development. I love their social media marketing templates they offer on their blog. 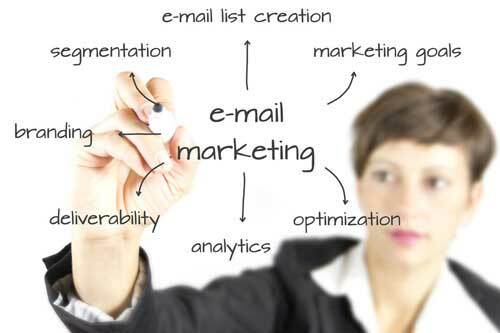 It is for email enthusiast and beginners, who want to develop their skills in email marketing. You will get the most updated and in-depth email marketing blogs only here. Litmus is an email marketing and optimization tool, which is quite popular and effective. Their blog offers more practical knowledge in email marketing. If you want to get insights on video marketing then Tubular Insights is the best. You get all the latest updates, case studies, trends and news for video marketing at one place. It covers both video production and marketing, which is great. If you’re in for learning the art of film making and marketing, then Vimeo blog should top your list. I believe, every digital marketer should have good knowledge of Photoshop. As it allows you to create variety of graphic content. The best place to learn Photoshop is the Photoshop website’s Tutorial section. I recommend every aspiring digital marketer to learn WordPress website development. For this, WP Beginner is the ultimate source of tutorials and learning resources. It is another great source of tutorials for WordPress. WPMUDEV blog covers advance topics in Multi-Site WordPress. That can equip you with knowledge to unleash the real power of WordPress. There’s lot of demand for Google AdWords’ professionals in India. You can start with basics here on Google AdWords Support. For advance topics and in-depth knowledge you can use this Google’s AdWords academy. Google Analytics is a tool that no digital marketer can live without. You can learn this tool at Google Analytics academy. Moreover, get certified in Google Analytics, free-of-cost. Pat Flynn is the super star in the world of affiliate marketing. Smart Passive Income is the best place to learn affiliate marketing. It is the best place for the free resources in web designing, web development and UX. You get free tutorials, fonts, learning resources and lot more here. There are lot of digital marketing books that you can use to learn digital marketing. I have listed out few of the best digital marketing books below. As digital marketing is ever evolving, that’s why try buying new editions. Also try reading from variety of books in digital marketing. The first book I read in digital marketing was written by Dave Chaffey. I can endorse him for his quality writing and unmatched knowledge in digital marketing. This book delves deeper into the topic of digital marketing insights, tactics, and integration. This book designed to give readers practical knowledge in digital marketing. Simultaneously cover almost all strategic concepts and tools in digital marketing. Content Marketing for Dummies and many more. As you can see the title says it all. It is recommended read for insightful information and knowledge in digital marketing. Learn Social Media Marketing from scratch to expert level using this book. Put it on your must read list. Do you love blending entrepreneurship with digital marketing? Then go ahead start reading this book now. It has lot to teach you in content and marketing. LinkedIn is one of the most powerful social media tool that’s still underrated. Read this book how you can use it for marketing and unleashing its true potential. UX is a strategic component in digital marketing that can boost your online ROI. You can learn more about it in this gem by Brian Solis. This is one of the most comprehensive books on digital marketing. It also has exciting series of checklists. It can take you in almost all aspects of digital marketing. Recommended read. There are lot more ways you can learn digital marketing apart from things I mentioned above. In India, there are professionals and experts willing to guide you to learn digital marketing. Provided you have few strong reasons on why they should be mentoring you. If you belong to any top university or college then it would be easy for you to find mentor. For others, you may have to impress with your skills and knowledge. You could join any online or offline digital marketing course programme to learn digital marketing. At Learning Skills, we offer the best-in-class and industry’s most comprehensive digital marketing course in Delhi. For more information on the digital marketing course, you can contact us on +91 8010880027. Or mail us at to@learningskills.in. Our counselors, would love to help you make the right career decision. You can visit my personal website here. You can also follow me on Facebook, Twitter, LinkedIn and Google+. If you have questions, then please feel free to share them using the comment box below. I would love to answer and guide you. Kanishk Matta is the digital marketing consultant, trainer, and entrepreneur. He is running two successful ventures. And trained more than 200 people in digital marketing. He loves answering questions on digital, feel free to ask one.